Inflammatory bowel disease (IBD) describes a group of disorders which are caused due to the inflammation of the intestine. Various symptoms of IBD are diarrhea, blood or mucus in stool, fever, abdominal pain, and others. In order to diagnose IBD, various tests such as C - reactive protein (CPR), Complete Blood Count (CBC), and calprotectin test are performed. The global Inflammatory Bowel Disease Market is estimated to grow at a CAGR of 4.0% during the forecast period 2018–2023. APAC is estimated to be the fastest growing market with a CAGR of 5.1%, which can mainly attributed to the growing consumer awareness about health care and fitness. The Inflammatory bowel disease (IBD) market report is segmented based on regions; disease indications such as Crohn's Disease and Ulcerative colitis; and diagnostic methods involved. In the U.K., the number of advanced nursing roles in patients with chronic, long-term inflammatory bowel disease has increased. The Inflammatory Bowel Disease market report provides a pricing analysis for different types of diagnostic procedures employed. North America held the maximum share of over 32% of the total industry in 2017. The market in APAC is estimated to have the highest CAGR of 5.1% during the forecast period 2018–2023. The ongoing R&D activities have given rise to new methods for diagnosis of IBD, thus decreasing the share of the older methods of diagnosis. The high initial capital required for the establishment of IBD diagnosis centers is one of the big challenges for the IBD market. The base year of the study is 2017, with forecast done up to 2023. The study presents a thorough analysis of the competitive landscape, taking into account the market shares of the leading companies. This provides the key market participants with the necessary business intelligence and helps them understand the future of the Inflammatory Bowel Disease market. The assessment includes the forecast, an overview of the competitive structure, the market shares of the competitors, as well as the market trends, market demands, market drivers, market challenges, and product analysis. The market drivers and restraints have been assessed to fathom their impact over the forecast period. This report further identifies the key opportunities for growth while also detailing the key challenges and possible threats. Diagnostic Method: Calprotectin, Blood Test, Endoscopies, Ultrasound, Imaging procedure, & others. Disease Condition: Crohn’s Disease, & Ulcerative Disease. End User: Hospitals, Diagnostics Centers, Pathology Labs, & Clinics. 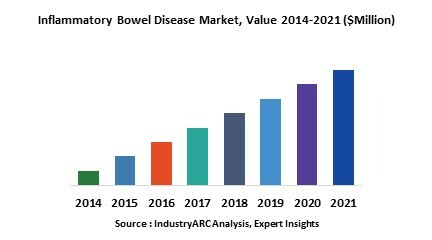 The key players of the Inflammatory Bowel Disease market include Johnson & Johnson, AbbVie Inc., F. Hoffmann-La Roche AG, Eli Lilly and Company, Pfizer Inc., UCB S.A., Takeda Pharmaceutical Company , Celgene Corporation , Shire Plc, and Celltrion Healthcare Co., Ltd.
1. Is the market for Inflammatory Bowel Disease growing? How long will it continue to grow and at what rate? 2. Which type of Diagnosis presents the major growth opportunities? 6. Which type of diagnosis will witness heavy adoption in the near future? 14. What is the futuristic scenario for the adoption of different diagnosis in the IBD market? 15. What is our Vision 2030 for the Inflammatory Bowel Disease Market? The Inflammatory Bowel Disease Market size is evaluated based on the number of products per organization type along with the varying price points pertaining to specific applications. These were identified as key informational conjectures for market estimation in 2017/2018. The Inflammatory Bowel Disease Market share is thoroughly checked against all data points that have been incorporated and rechecked against various data sources. Various C-level executives and key opinion leaders are contacted for verification of the data. The Inflammatory Bowel Disease market forecast and growth rate are achieved by applying the time series forecasting methodology on the various factors. The market forecast and growth rate are further backed with historical trends of the market along with a regressive mathematical model that assesses the value based on factors such as capital expenditure, equipment lifespan, R&D investments, and so on. The Inflammatory Bowel Disease market demand has been researched taking into account the prominent economies across the different geographic regions to understand their corresponding impact on the market. The Inflammatory Bowel Disease market drivers are evaluated for short-term, medium-term, and long-term based on the different market dynamics impacting the market. The Inflammatory Bowel Disease market challenges are evaluated for short-term, medium-term, and long-term based on the different market dynamics impacting the market. The Inflammatory Bowel Disease market trends have been analyzed taking into consideration the micro and macro trends prevalent in various geographies. The Inflammatory Bowel Disease market outlook provides a brief overview of the market performance and anticipated change in market dynamics. The Inflammatory Bowel Disease market analysis also involves the identification of new companies that have entered the market scenario and their impact on the market dynamics in the future.